if they could be drawn and mapped in any way, the communication lines around me of late would look like this photo. many lines of input, some tangles, some output, a few knots, the odd loop and a whole lot of mess. where to begin untangling and move toward understanding? i'm at a loss. and it's going to get uglier before it gets pretty. where is a moment of perfect clarity when you need one? 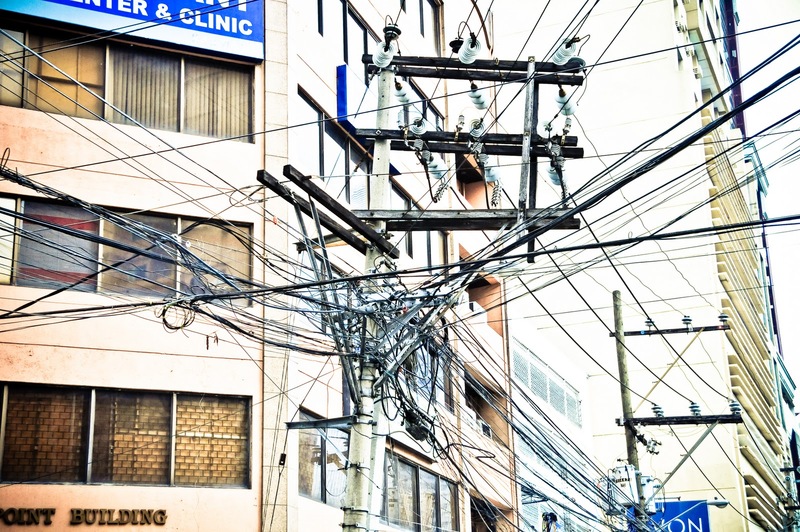 ah, but if you look at your picture there are some very definite strong wires in amongst the tangles. I think you should search for those and follow them. The fact that you see the lines is the moment of clarity. You have to decided what is wanted of the communication. What is the purpose? Than cut the unneccessary away, set them aside, and a clear field of communication lays before you. Sort of like the old game of Tiddly-Winks. First determine the supporting pieces, define their supports to protect them. Then one at a time remove the peripherals, carefully, slowly, determining with each action the reaction. You will know when you have removed enough. It may still look a little tangled, a little disorganized, but it's all good, sometimes that is just the way it is. The clarity? At the center. Center yourself. Communication breakdown can be a nightmare!!! Start with your own clarity and move outward. Good luck. oh my, i have been at the place, and i know i will be there again, but just now I am in the clarity place. you will get there, too. you will.